One crore vehicles in Bengaluru by 2022? Statistics shows that nearly 70 percent of vehicles registered in Bengaluru are two-wheelers and close to 20 percent are cars. 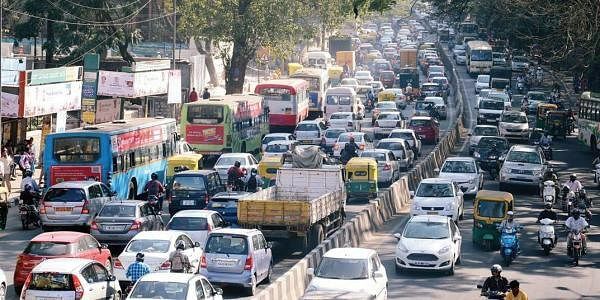 BENGALURU: Wondered why traffic eats into a major part of your working day? Numbers have an answer. Since 2009, the number of BMTC buses has increased by just 449 while the number of two-wheelers and cars have witnessed an exponential growth in the same period- 22.37 lakh and 6 lakh respectively. Effectively, the total number of vehicles in the city have also almost doubled- 34.90 lakh vehicles in 2009-10 to 67.22 lakh now. With metro rail progressing at snail’s pace, suburban rail project yet to take off and road widening plans being hit by land acquisition delays, experts suggest expansion of BMTC bus services, levying congestion tax, regulating per family vehicle ownership and promoting car pooling could help stem the growth of private vehicles. Statistics shows that nearly 70 per cent of vehicles registered in Bengaluru are two-wheelers and close to 20 per cent are cars. According to 2011 census, Bengaluru has a population of 84.43 lakh and the number would have crossed more than 1 crore by now. However, city has only 6,207 BMTC buses against the required 12,000-14,000 buses. Travel speed has dropped to less than 10 kmph during the peak hours in most stretches in the city. Going by the annual growth rate of vehicles of 10 per cent, the city will have 1.08 crore vehicles, including 74.95 lakh bikes and 20.96 lakh cars in 2021-22. An average car takes 12.5 sqm (2.5m X 5m) parking space. It will need 2.62 crore sqm parking space for 20.96 lakh cars in 2021-22. At present, the city has 11 multi-level parking facilities (BBMP & BMTC). In 2016, Bengaluru Traffic Police booked maximum cases against wrong parking (22.01 lakh cases). This clearly shows the need for more parking spaces. However, most of BBMP’s proposed multi-level parking facilities remains on paper. He said improving public transport, stopping building infrastructure for cars (flyovers, widening roads), reducing on-street parking and encouraging walking, cycling would hep reduce private vehicles. A senior government official said there are some practical difficulties in implementing tough measures like congestion tax, restriction of vehicles per family and heavy road tax. “Nearly 130 km of the Metro will be operational by 2020. Once it is completed, nearly 20 lakh people are expected to leave private vehicles and use the Metro which would reduce congestion,” he said.